Notice is hereby given that sealed bids will be received by the City of Ilwaco for the FY 19 STREET REHABILITATION Project until April 17th, 2019 at 2:00 p.m. Bids will be accepted in person at Ilwaco City Hall at 120 First Ave N, Ilwaco, WA 98624, or by mail at PO Box 548, Ilwaco, WA 98624. The timeliness of the Bid Proposal will be determined by the actual receipt date and time. Immediately following closing of the bid period, the bids will be opened and publicly read aloud at Ilwaco City Hall. Bid proposals received after the deadline stated will not be opened or considered. This contract provides for the placement of Hot Mix Asphalt and Fiber-Reinforced Hot Mix Asphalt (CL ½ IN. PG 64-22) overlays along approx. 2000 feet of Ortelius Drive and placement of a double Bituminous Surface Treatment along an additional approx. 440 feet of Ortelius Drive. The work will also include pavement repair/crack sealing, planing bituminous pavement, roadside cleanup/shoulder blading, utility adjustments, traffic control and other work, all in accordance with the Contract Plans, Contract Provisions, Contract Special Provisions, and WSDOT Standard Specifications. The Engineer’s opinion of probable construction cost is approximately $240,000. Questions regarding this Project may be directed to Holly Beller, Treasurer, City of Ilwaco, Phone (360)642-3145 and Email treasurer@ilwaco-wa.gov. Questions received after April 12th (2 full business days) may not be considered. Complete digital Project bidding documents are available upon request from the City of Ilwaco in person, by phone, or email. A link will be provided to a secure Hightail file sharing website where the files may be viewed or downloaded for free. Please contact Pavement Services, Inc. at jamundsen@pavement.services or (503)235-0377 for assistance with any issues pertaining to the Hightail file sharing site. A complete paper set of Bid Documents is also available for inspection at Ilwaco City Hall. All Bid Proposals must be submitted on the forms furnished in the Contract Provisions, and each must be accompanied by a certified check, cashier’s check, or bid bond (with authorized surety company as surety) made payable to the City of Ilwaco in an amount not less than five percent (5%) of the total bid including sales tax, and all listed additives and alternates, if any. Cash will not be accepted. Washington State Prevailing Wage Rates for Pacific County apply to this Project.  The City of Ilwaco reserves the right to reject any or all bids and to waive any irregularities in the bid or in the bidding process, and make the award as deemed to be in the best interest of the City. The City of Ilwaco is an Equal Opportunity Employer. Dates of publication in the Chinook Observer are April 3 through April 17, 2019.